Feeling the need again to just look ahead of me and walk, I went to Filey Bay, a favourite place. A windy day and partly overcast, light and clouds alternating like disordered thoughts; the tide just beginning to ebb, a sliver of beach appearing in front of the sea wall at Filey. I set off south along the thin sabre-curve of the bay, towards the start of the Flamborough Head cliffs four miles away. I wanted to be on my own, quite frankly, to sweat out a certain muddle of thoughts, but the beach was busy until well past the Reighton Gap caravan site. 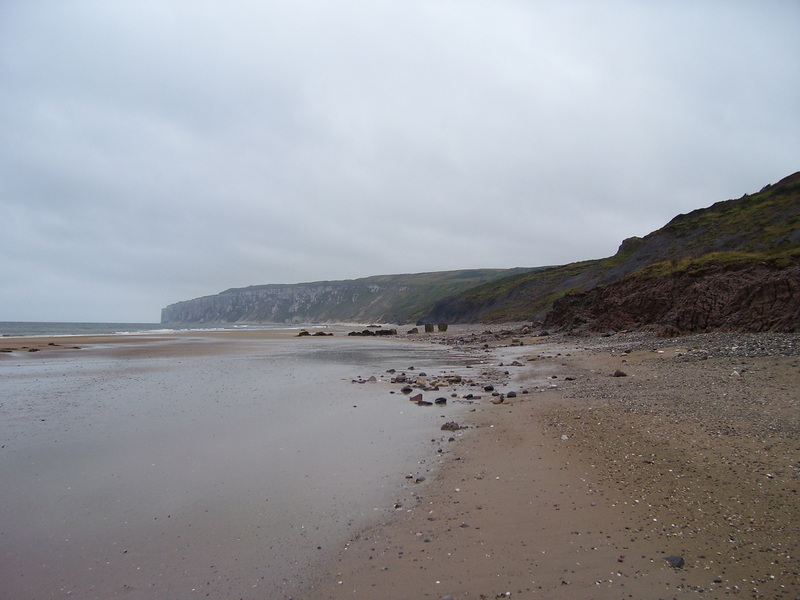 People radiated out from different points of the bay – Filey, Primrose Valley, Hunmanby Gap, Reighton Gap – but they rarely ventured far from their entry point, even the dog walkers. I’ve started to find it more and more odd that people view the beach as a place to let go of thinking, as if here, beyond the edge of the great ant hill and out of reach of employers, tax men and worries, there is nothing left to shackle them to the necessity of thought. The beach is as blissfully blank as a crisp, unslept on hotel bed; the sea, an impeccably discreet and dedicated night nurse, wipes the beach’s fevered brow clean of all cares twice daily. And so here you can pitch your stripy wind break and lay down your trusty picnic blanket, beneath forty feet of boulder clay cliff made of rock ground and pulverised to fleshy mud by groaning, creaking glaciers crushing their way across the terrain of the North Sea and giving succour to the weird shapes of butterbur and coltsfoot. Here is an excellent place to play rounders and show your toddler how the shore is littered with the partly decomposed mesoglea of thousands upon thousands of moon jellyfish, proclaiming that death will triumph over you too. And so, a misanthrope and buried in my own self-aggrandising daydreams, I strode forth, overtaking far more casual strollers and those tethered to dogs and companions. I should have worn a hoodie so that I could have pulled the hood around my face in order to feel even more like a monk. Filey Bay is a place where space seems relative, expansive, changeable, like in a dream. Time shrinks with the tide and you get places quickly and it surprises you, or it expands away and you seem to be going backwards, away from your destination and against the direction you are actually walking. The curve of the bay means that you can see every point along it from every other point, you are never out of sight of where you are going to or where you have come from. Before I knew it, I was at the further reaches of the beach and the people thinned out. The last trickle of humanity was a group of teenagers who picked their way down the path, barely discernible from the beach, that takes you up onto the high chalk cliffs. I owe to them the fact that I found the path myself. The change is very sudden and you find yourself in another place, although the distance is not very great back to the Reighton Gap caravan park. Ahead tower the sheer chalk cliffs of the headland, swirling with gannets. Chalk boulders from a series of rock falls block the way and must be clambered over. Smaller chalk pebbles, mixed with flint nodules, have been swept into neat banks at the foot of the clay cliffs. The rounded stones have fissures that look like the sutures on a skull; the effect is of half buried skulls, some hobbit sized and some gargantuan and misshapen. Strange twisting valleys choked with willowherb and brambles divide the final stretch of boulder clay deposit before it gives way to chalk. The sea has sculpted the sand into hard undulating ridges that tire the feet – somehow, reality never gets caught out: the sea never forgets to create and recreate these shapes. Wading through pools of water left by the retreating tide, I get caught out by how deep they can suddenly become. Places which are wild resist human movement: one of the things I like about Bede’s Ecclesiastical History of the English People is the sense it gives of how difficult travel was in those days across a land of marshes, woods and rivers. Familiar place names juxtaposed with an unfamiliar terrain. In one of these pools I nearly catch myself on a curved sheet of iron jutting out of the sand; part of the wreck of a steam cargo vessel called the Laura, which foundered on this beach in 1897. The Laura’s two boilers were just starting to be revealed by the tide. There are several wrecks along this stretch of coast, including a First World War submarine which is hard to reach. The striking thing is how something so large can be rendered down into a few fragments, like a whale that’s been stripped down to a few bones. The Laura was dismantled for scrap – I don’t know why they left the keel and two boilers. The keel emerges sometimes from the sand, like a bad memory, or a ghost, only to be covered up again. Clambering underneath the chalk cliffs is an intimidating – and dangerous – experience, and I daren’t go far, even though I know I have several hours before the tide starts to flow. Easy to slip down between the boulders with a broken ankle. Would anyone find me? There is another ship’s boiler, broken and covered in rough barnacles, a short distance from the Laura. This comes from a trawler called the Diamond. Boilers from a further three (at least) trawlers can be seen between here and Flamborough Head (I’m indebted to Lee Norgate’s website for information about these wrecks). Interesting what survives longest of things: boilers from steam ships, tests from sea urchins, bones, shells, names, memories. I sat on the rocks and tried to write notes. Somehow, stopping moving stopped me thinking. I noticed a dark shape a short distance away which turned out to be a cormorant, its head tucked mournfully into its back feathers. I approached it and sat next to it. It woke up and approached me, probing its narrow beak towards me, and then veered off behind me when it realised I wasn’t a source of food. I suppose it was sick or injured – though I couldn’t see an injury. I thought about trying to take it to a vet or animal sanctuary, but carrying a struggling bird four miles back to Filey didn’t seem an option. I hoped it would die before gulls found it and left it be. I decided to try to head up onto the cliffs via the path that I’d seen the teenagers use. This did indeed take me by a windy route up to the top, where I joined (and discovered) the Headland Way. I only had time to walk a couple of miles along the cliff top – I was some way off the buildings of the RAF Bempton World War Two radar station when I turned back. Gannets rise overhead and perch metres from the path. Perilous to try to approach for a better view of the colony, but I could see dark coloured juveniles on ledges. Inland a combine harvester was at work. You can see all the way to the sea on the other side of the headland and down the coast towards Spurn. It’s unusual to be able to see such a recognisable feature from the map of England on the ground, but you can more or less see the whole headland from the Buckton cliffs. Inland is a landscape of arable fields. The village of Speeton perches on a prominent knoll, which reminded me of the knolls which are often occupied by farms in the flat southern plains of Iceland. A three storey farm house with all of the upper windows bricked up intrigued me. Louis Aragon, in Paris Peasant, has a great line about (as far as I remember) a red checked table cloth teaching you about the mysteriousness of the world. A triangular field filled with gone-to-seed thistles all shedding fluff in the wind and swaying slightly does the same thing to me. I had to turn back because I’d left my family with friends in Filey and they were getting ready for home. I could see Filey quite clearly, but it took me a long time to get back there. By the time I was back down on the beach it was nearly deserted – and massively wider, due to the tide being fully out. The narrow, crowded beach of a few hours earlier (not dissimilar to a gannet colony) was gone like a mirage, replaced by the aching empty space I’d sought in the first place. Thousands of blobs of jelly, the last remains of moon jellyfish, led the way like breadcrumbs. I reacclimatised myself to humanity by eating fish and chips from a carton while the kids wet themselves in a fountain marked with the directions of all the Shipping Forecast sea areas.